My brother Matt emailed me today saying he was fed up with CenturyLink’s slow internet service and blackouts. He asked for pointers on how to find a good internet service provider and what to look for. He also admitted he wasn’t an informed consumer when they originally signed up and probably chose the cheapest option. I would imagine he’s not alone. I, on the other hand, spent hours and hours researching our options for internet access when we moved from California to Indiana. The city we chose was directly related to the internet coverage. We only looked at houses where Brighthouse provided service. This is a summary of how you can improve your internet speeds and service, with all the resources I used. 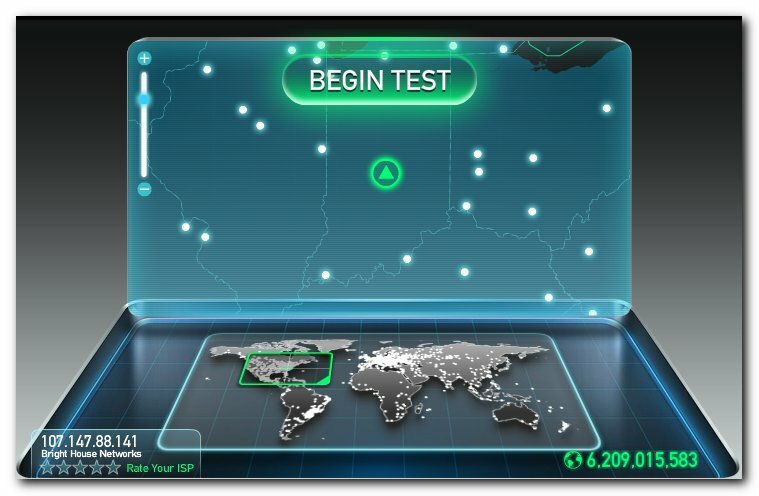 To find out what your internet speeds are, visit Speedtest.net and click on Begin test. To get an accurate result, make sure your internet connection isn’t being used for anything else while the test runs. That means no Netflix streaming, watching YouTube videos or Dropbox syncing. Fear not, the test only takes a minute. But your results will vary throughout the day, so you might want to run the test a few times. Download speed is the most important number. It’s the upper bound of how fast you can download from the internet. It will affect how fast web pages load, how quickly YouTube videos stream, and just about everything else you do online. Download speed is measured in megabits per second (Mbps or Mb/s). To convert to how many MB (Megabytes) you can download in a second, divide the number by eight. For example, a 10 Mb/s connection would be able to download 10 / 8 = 1.25 MB (Megabytes) in a second, or a little less than the size of an average web page. You upload whenever you send files from your computer, like uploading pictures to Facebook, sharing a file on Dropbox, adding an attachment to an email or backing up your files to the cloud. The higher the number, the less time it takes to upload. The units are the same as downloads, megabits per second, but the speeds are often much lower, especially with cable internet services like Comcast. A network ping is like a submarine sending out a radar ping. The shorter the better. Generally if it’s less than 50 ms you shouldn’t have any noticeable problems. Pings are measured in milliseconds, or one thousandth of a second. It’s pretty cool if you think about it. You send a tiny ping across the country (or even the world), the server replies that it’s there, and the round trip takes less than a second. There are several changes your ISP (Internet Service Provider) can make on their end to improve your service. It’s often helpful to give them a call. However, ISPs have some of the worst customer service out of all companies, not just ISPs. They’re so bad, they are listed among major airlines and cell phone providers. I’ve found using online chat from the ISP’s web site to be a less frustrating way to get help. My ISP sent out a technician to my house (for free) to make some adjustments when our cable service was having issues. There are a few adjustments you can make in your house to make sure you’re getting the fastest service possible. Whenever possible, use an actual ethernet cable from your router or cable modem to your computer. Wireless is convenient, but it’s just not as reliable and doesn’t perform as well. You can also check the cables from your devices to make sure they’re all plugged in securely. Sometimes a flaky connection is due to a curious child messing with the wires, or cats. If it’s been a while, rebooting your cable modem and router can help your performance. You can also upgrade the firmware of your router. The details are beyond the scope of this article, but you can find more information at the router manufacturer’s web site. The easiest way to find out what plan you’re on is to look at your bill. It should have at least the name of the plan, if not the speeds. Then you can go to the company’s web site to find out the speeds for that plan. Just so you know, they sometimes make it hard to find the upload speed. The download speed will be front and center. You can often find a rate card too. Here’s CenturyLink’s rate card that lists all their plans with the price and upload and download speeds. But as you’ll see later on, the prices on the rate card were different from the site. The easiest way to get higher speeds is to upgrade to a faster plan with the same company. A second option is to switch to another ISP with a better deal or higher speeds. The problem is many people don’t have the second option. ISPs have gotten together and agreed to stay out of each other’s areas of service. These agreements mean there’s little to no competition, and it’s part of why internet speeds in the US are five times as expensive as top-rated South Korea. If only Google Fiber would roll out to more cities. Their $70/month service gives you 1,000 Mbps for downloads and uploads! What’s Available At Your Address? If you know your neighbors, you could ask what they use. They can also tell you about the quality of their service. Next, enter your zip code at Broadband DSL Reports to find reviews from actual customers of various services, and to give you an idea of what’s available in your area. Entering Matt’s zip code produced these results. 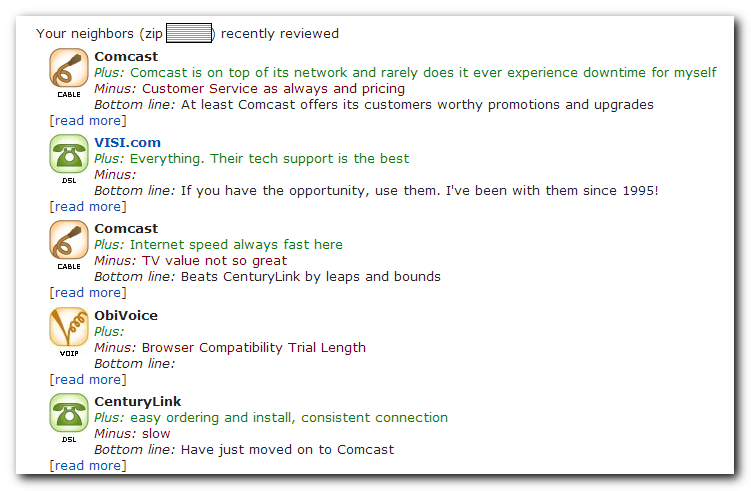 It seems users in the area prefer Comcast over CenturyLink. Next, enter your street address at AllConnect.com. The results are usually valid, but not always. You’ll want to double check at the ISP’s web site. Matt’s address showed CenturyLink and Comcast, which confirms what we saw at DSLReports. The National Broadband Map listed Comcast, CenturyLink and MegaPath, but MegaPath is just a voice provider. Based on the results above, our two options are CenturyLink and Comcast. The crazy part is all four options cost $29.95. This makes no sense. And to show you why their customer ratings are so abysmal, they charge $20 for internet activation, $100 for the modem and $15 for shipping. Confusing pricing schemes and $135 of extra charges. Nice. All four plans were for DSL service too. DSL (Digital Subscriber Line) uses your telephone line, though you can still make phone calls (unlike old school dial-up). Cable internet (over cable lines) typically has better performance and Comcast is a broadband provider. Comcast’s site showed they too provide service at Matt’s address. They have a 25 Mbps plan for $30/month, but the fine print says after the year contract is over, the bill will increase to somewhere between $42.95 and $66.95. Again we see why these companies are rated so low. The last site to try is CableMover. You can leave the email address blank and just enter your street address. It redirected to Comcast when I entered Matt’s address so we didn’t get any new information. In Matt’s case, my recommendation is to go with Comcast. They have absolutely terrible customer service, but their internet service is pretty good. And from what I saw in the reviews on DSLReports, CenturyLink’s internet service is bad. Ideally you won’t have to interact with customer service much, but you use the internet service every day. It’s the lesser of two evils. I ran another speed test this morning while I was fixing some typos in this article. As you can see, I got a far more satisfying download speed.